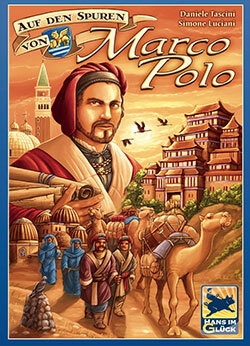 In this highly anticipated game published by Hans im Glück we travel through Asia following the footsteps of Marco Polo and on our arrival build trading posts. From now on, we are able to trade gold, pepper and silk there. If these locations coincide with our personal goal cards we receive additional victory points at end of the game. The supply of goods is handled by a very nice dice-worker-placement mechanism and these goods can into victory points using contracts or our trading posts. But the icing on the cake and a real highlight are the characters. Each player at the beginning of the game takes in a different role card with specific game advantages. Adjusting one’s tactics to those characters is the key to victory! Even if this has not worked so properly in the first few games, this and the variable game setup provide many challenges for ongoing fun in many more plays. “The Staufer Dynasty” is, after “Hansa Teutonica”, the second game by Andreas Steding, which is awarded our Game of the Month title. This time, he has come up with a roundel as a new mechanism, where our workers move and try to win majorities. Workers and movement points are scarce and thus it is important to keep a close eye on the other players. Hence interaction is guaranteed. The amazingly simple but remarkable mechanism for determining the order of play as well as the secret end game goals add the extra something to the game. Although some might have preferred a little less of that something. 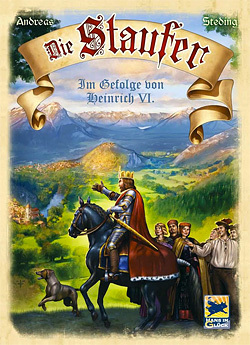 This game has been one of our most-discussed and played games in the past, and of course there is the computer conversion by our Westpark member Günther Rosenbaum. So everybody was happy to get this game back on the table, in its shiny new version with added expansions and new tactical possibilities. 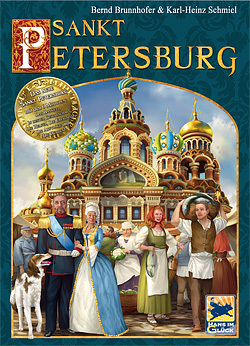 St. Petersburg is still an excellent game and has lost nothing of its original appeal. It merges an accessible and easy rules system (which is – despite the theme – a completely abstract empire building style card game) with a fast playing style that gives many options for the players. The main new addition is the “market”, which is a new victory path that players can either concentrate on or that can be combined with other victory paths. The new rules integrate seamlessly into the system and really add something to the game, so it can probably be forgiven that the mini-expansion that was only available for Kickstarter supporters of the new addition is a bit lame. St. Petersburg is still alive and kicking and can be wholly recommended! If someone had told George Orwell in the year 1948 that humanity would deliberately try to create the perfect dystopia in the future, he would have thought they are mad. 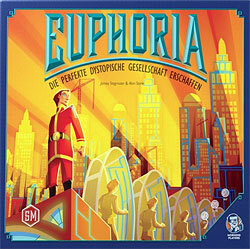 And I don’t mean the excellent board game “Euphoria” which exactly uses this scenario as a thematic base – because in contrast to our increasingly surveyed and manipulated world “Euphoria” is quite a lot of fun, even though it is a “Kickstarter”-game (which are looked at especially critically in our group). “Euphoria” uses many new mechanics that make worker-placement (or rather “clone-placement”) fresh and new. Even random dice play an important role (without making the game random). And although the rules seem complex at first the game plays extremely fluidly and keeps one’s interest. It is probably impossible to experience a real dystopia that fast and beautiful – therefore we give this game quite unanimously the laurel of our “game of the month”! 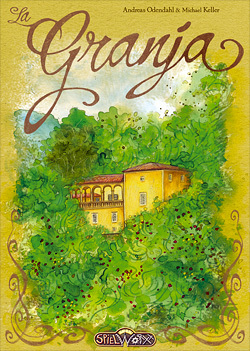 “La Granja” offers interaction and competition, constructive and progressive development, optimization in selection and sequence as well as an abundance of possibilities to bypass bottlenecks in supply and demand. Everything has effects and side effects. Despite its countless dependencies, the complexity is easily manageable. 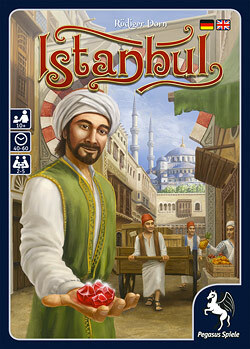 The game’s elements and mechanics are superbly supported by the graphics design and the superbly structured rules. With “La Granja”, Odendahl/Keller developed a beautiful, new and functional machine out of familiar elements. This alone is a commendable feat of engineering. With his vast experience as a game designer, Rüdiger Dorn has created a solid game, which provides smooth, well-rounded gameplay without creating aggression or frustration. It offers easily detectable solutions or alternative solutions for each situation, and conveys pure, constructive fun. The game material supports this excellently and even a five-player game is pleasing and playful. 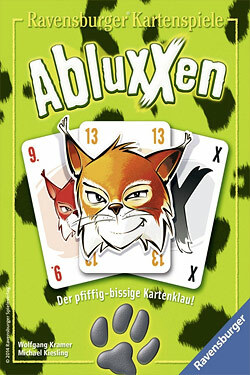 A worthy winner of the “Kennerspiel” award. “Helios” many tactical options create a high replay value and provide a well-rounded, fast yet relaxed, constructive gameplay. 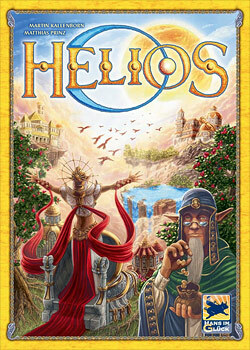 And its concise rules, its great freedom of action and the many different winning strategies make “Helios” without any doubt a “gamer’s game” and a worthy recipient of our “Game of the Month” title. This little card game by the Kramer/Kiesling team offers a thrilling battle for the highest and thickest card multi-tuple. On each turn, even those of your fellow gamers, everyone is involved. This interactivity is highly complex and the goddess of fortune is also given a nice spot. But according to the law of large numbers, the influence of luck is balanced out sooner or later. You have options; you actually have a lot of options. And throughout the game you can hope to have made the right choices in each of your turns. Well, what more can you expect from a card game? The theme of coal mining apparently has us in its black grip – this month we give our award to yet another game about the mining business, this time created by one of the most reliable game author duos ever: Michael Kiesling and Wolfgang Kramer. Up and down goes the elevator, probing deep into the nether regions of a coal mine (small reductions here for the accident-prone game material), left and right we dig into the mountain, trying to preserve the balance. Of course there are also missions to fulfill, which means planning ahead and maximizing one’s moves. The nice trait of “Coal Baron” is its low complexity – the game mechanics are logical and easy to grasp, therefore it is an ideal introduction game that also keeps professionals happy. Never was a game of the month more discussed than this game. 50% of us hated it, 50% loved it to bits. As you can see the latter 50% have prevailed. If you like the game or not will therefore definitely be a matter of taste. But it should be noted that the ones of us that liked this game not only loved K&K….but loved it to bits. And that is quite revealing.